Have you tried Bak Kwa Fried Rice? This is my most recent “invention” and improvised by my mother who added some sliced okra (a.k.a. =lady fingers) in the fried rice which made the fried rice tasted smoother. This dish was inspired by some Bak Kwa I bought at a food fair recently at the Singapore Expo. Who can resist a 50% discount for Bak Kwa. I knew my family cannot finish all the Bak Kwa I bought, so immediately decided to turn it into this Bak Kwa Fried Rice for dinner. I steamed the Bak Kwa before frying the rice so that the Bak Kwa has softer texture and in fact, through steaming, it forced some oil out from the Bak Kwa which would make the fried rice tastes less oily. The first time I did this dish, I didn’t steam it and the texture didn’t blend very well in the fried rice. Second, adding the sliced ladyfingers gave the fried rice a smoother texture and made it very tasty because of the sticky sap. 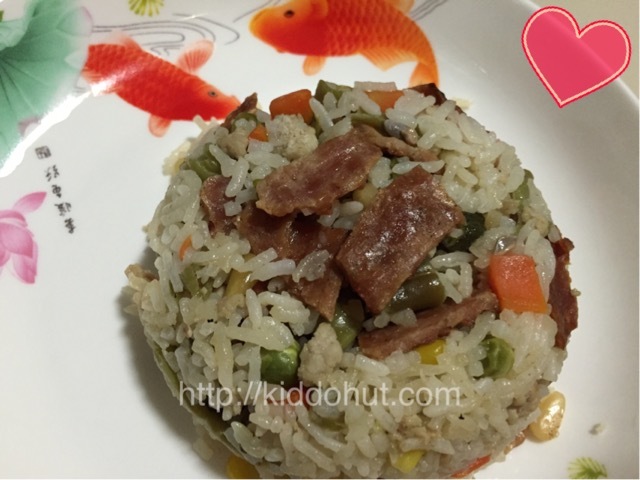 This is a very easy dish to cook and will be a definite hit for both kids and adults. It tastes savoury and sweet at the same time with a chewy yet smooth texture. The best is, it takes less than 30 minutes to whip up this meal! 1. Steamed the Bak Kwa for 5 minutes. 2. Heat up the frying pan / wok with some oil. Stir fry the minced pork until cooked. 3. Add sliced garlic, followed by cut Okra and stir fry for 3 minutes. 4. Add some salt to taste, then mixed vegetables and stir fry for 2-3 minutes. 5. Add rice and cut Bak Kwa and stir fry to mix well. Serve.